Vera Bradley Rosewood Scarf Collection Rosewood Dots. Printed Ply Scarf. Oversize Scarf. Women's Colorful Wave Dots Neck Kerchief Twill Silk Small Square Scarf 23"*23"
AUTHENTIC VERA BRADLEY Soft Fringe Scarf. This super chic scarf by Vera Bradley is oversized to drape beautifully with a soft hand feel and eyelash fringe on all sides. Color - Black with Grey and Golden Tan. NEW! WOMEN'S IKE BEHAR REVERSIBLE FASHION WRAP SHAWL! VARIETY OF COLORS! AUTHENTIC VERA BRADLEY Soft Fringe Scarf. This super chic scarf by Vera Bradley is oversized to drape beautifully with a soft hand feel and eyelash fringe on all sides. Color - Plum with Magenta. 100% polyester and lace. Very soft and washable. Can be worn wrapped around the neck or as a shawl. This is a beautiful scarf from Tickled Pink. It is mostly white with pink, blue, and yellow polka dots. It is a thin material, making it great for all seasons. It is perfect for work or casual wear. Material : Voile. It is very comfortable to touch and wear, soft touch your skin. Color : Pink Gray. We will work with you to resolve any problem you may have. Light Yellow Scarf with Square Polka Dots Lightweight Scarves Neck Wrap Christopher & Banks. So many different ways you can wear this scarf. 20" wide x 80" long. Material: 100% Polyester. Total Betty Silky Dot Bandana. Silky printed scarf featuring contrasting stripes and polka dots. Color / Material: Yellow, White / 100% Polyester. • Hand wash. • 100% Polyester. by Free People. Woman's silky + sheer scarf Green White Dot 20" square New FREE SHIP! Woman's silky sheer scarf Green White Dot 20" square New. Machine washable. Back body length (in): 31¼. Sizing: One Size. Made in China. Care Instructions. Lovely pareo, wrap, even a dress with a pattern of super cute birds with small white polka dots over black made in India. From Yale's Peabody Museum o Natural History. Care: Hand wash in cold water, dry flat. Rarely used. You just never know what you may find here! If you love eclectic, you will love this site! If this ends up being too high. I do not calculate the international fees for these locations. Woman's silky + sheer scarf Multi Dot 20" square New FREE SHIPPING! 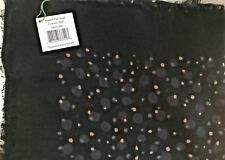 Woman's silky sheer scarf Multi Dot 20" square New. Front- Navy Rose print Lace W/ Silver Polka dots. Justice Infinity Scarf. Back- navy knit with silver polka dots. The scarf is labeled blue, but has red, white, gold, aqua & yellow colors. FEATURES: Oblong Shawls Lot of 4. Starting with the more casual shawl, it is labeled as being 100% polyester, it has a light taupe background with a pale pink, bright aqua, purple and white paisley print. CHARLIE PAIGE Polka Dot Scarf Wrap Shawl Foulard Oversize. Gray dotted Neck Scarf 8"x32". Scarves Type:Shawl Scarf Sjaal Snood. Scarves Type:Shawl, Wrap. Material:Viscose,Cotton,Polyester. Model Number:Viscose Scarves. Scarves Material:Viscose Cotton. Material: Cotton Pashmina Viscose. Pattern Type:Floral High Quality Scarf. This black continuous loop polyester scarf has silver polkadots. It is 70" around and 20" wide. It is adaptable to a variety of styles. It looks new, but it has no tags. Black/White/Pink, Polka-Dot. I want you to be 100% satisfied! This happens a lot with very dark or very bright colors. Colors/textures may vary in appearance depending on your monitor/computer screen settings. 12% Goat Mohair. Shawl size: Approx 35" x 70". Hat size: Fits to 22-23 head circumference. The belt on the hat is removable. It's light weight and very warm! 78% Acrylic. Care: Hand wash and flat to dry. Talbots Womens Scarf/Wrap Reversible Gray & Black Stripes & Dots w/ Fringe NWT! Reversible to opposite colors. Great accessory item that will go with so many outfits! • Size: 12”x58”. This scarf is inExcellent Pre-Owned Condition, with no stains, holes or pulls! So the fabric is still in very nice clean-cut shape & the colors are still crisp & vibrant as well! 5.As-Is/Acceptable - This item will have multiple issues & was used a lot! FASHION LOG WINTER SCARF. It's very important for us.